What is a Smart Home | Automation, Security, Audio/Video | EZ-Integration, Inc.
A Smart Home is a house, condominium, or apartment that has devices for controlling security, lighting, temperature and humidity, irrigation, multi-media, surveillance, and many other functions. These devices can be controlled while you're at home and remotely when you're not with smartphones, computers, and tablets. 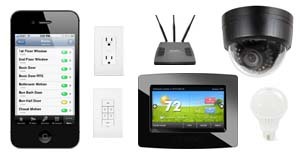 In a Smart Home programs automate the function of the devices around your home for you. The purpose of which is to empower you, the homeowner, with greater control over your home while making it easier and more convenient to manage. A Smart Home also connects all of these devices to each other, allowing them to communicate with one another. The benefit is that an action or event occuring in one can trigger an action in others. For example: You walk out the door in the morning to go to work and arm the security system. This triggers your Smart Home to lock all the doors, turn off all the lights and electronics in your home, and sets your thermostat to a more efficient setting. With a single action many are triggered and it was as simple as walking out the door.